Pasta is not necessarily evil. 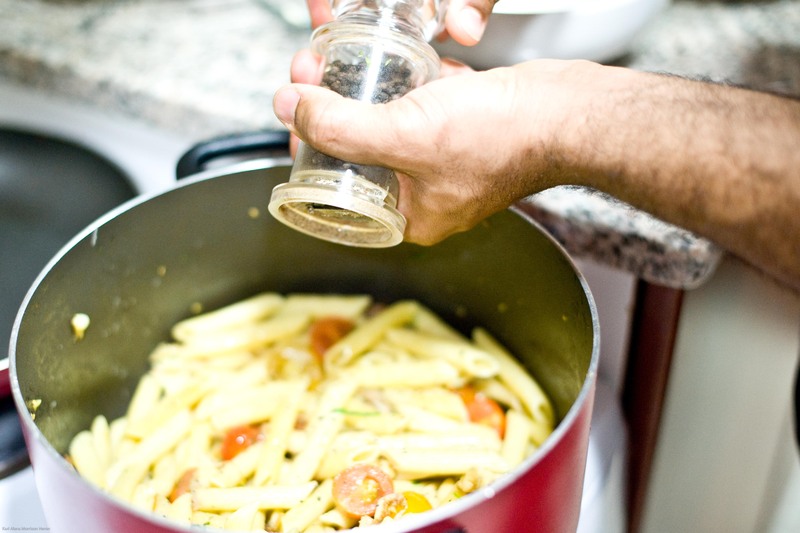 Non-Italians have a misconception of pasta and serving sizes and some of us believe that Italians break their fast with pasta and have night caps with a side of pasta every single day . Not so! 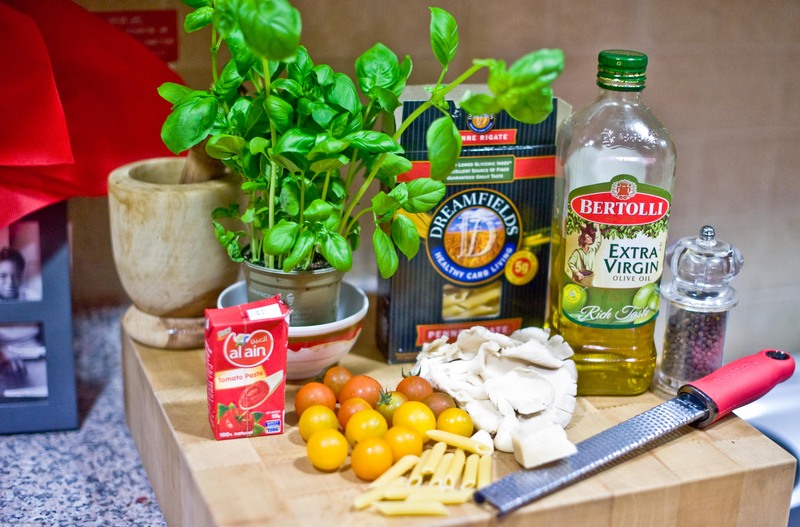 Italians eat a lot of vegetables and a wide array of dishes which are made with fresh seasonal ingredients. They often make their pasta at home, which though is easy, is not something most people do everyday. 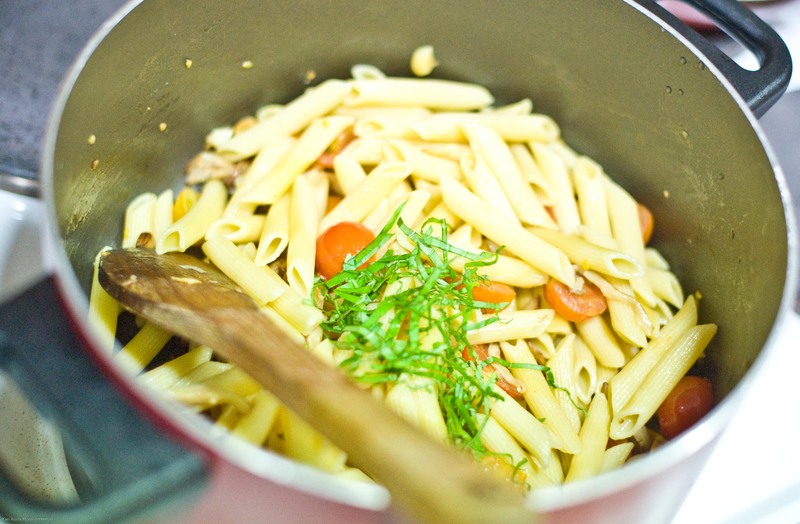 Hence, pasta is not eaten in huge boatloads and is usually part of a meal with many courses. Therefore, a little goes a long way. Different regions also fortify their homemade pasta with wholemeal flour or with vegetables. Some who are diabetic cannot take white flour without serious spikes in blood sugar, others just have to stay away from gluten, but if you are otherwise healthy and simply trying to find healthier ways to change your lifestyle, a dish like this strikes perfect balance. 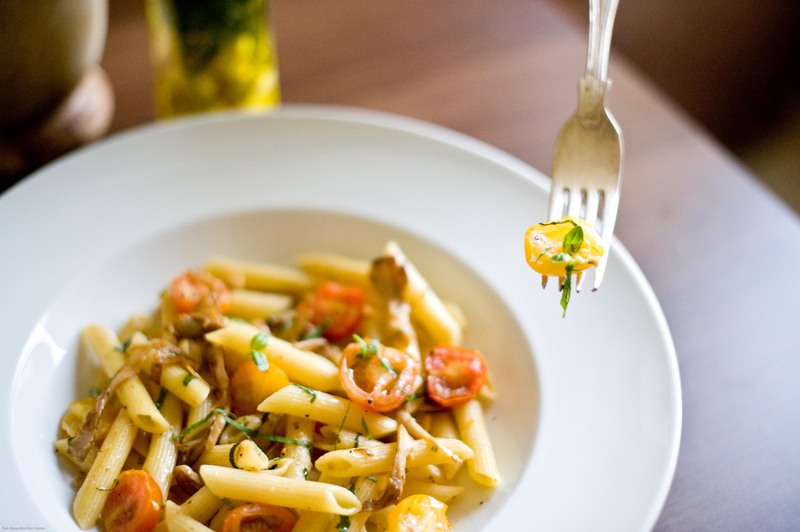 The philosophy is simply ‘Enjoy your favourite foods but find ways to make them healthier by kicking up the flavour and the nutritional value.” Primavera implies the vegetables of the spring (or here- summer) and so this dish features pasta but equal attention is paid to the vegetables. You are free to use any kind of vegetables you have on hand or you like, just take the concept of adding veggies to your pasta and make it work for you. We created this dish some months ago when local tomatoes were in their prime in the Middle East, but since tomatoes are the flavour of summer elsewhere, it is still a timely recipe for you. While we do make our own homemade ravioli and tagliatelle sometimes, it is usually for very special occasions. We used Dreamfields Pasta in this recipe because we found that as pastas go, for us, we were able to eat less and not feel ravenous shortly after. This is not the same for everyone as some people are still affected by this low carb pasta the same way as the normal (and much cheaper variety). So, for some, this is a good alternative to pasta. However, not because it’s lower in carbs means you should pile your plate mile-high. In fact, it is more filling and you should be able to have less. Again, our disclaimer is that it doesn’t work for everyone so results may vary. 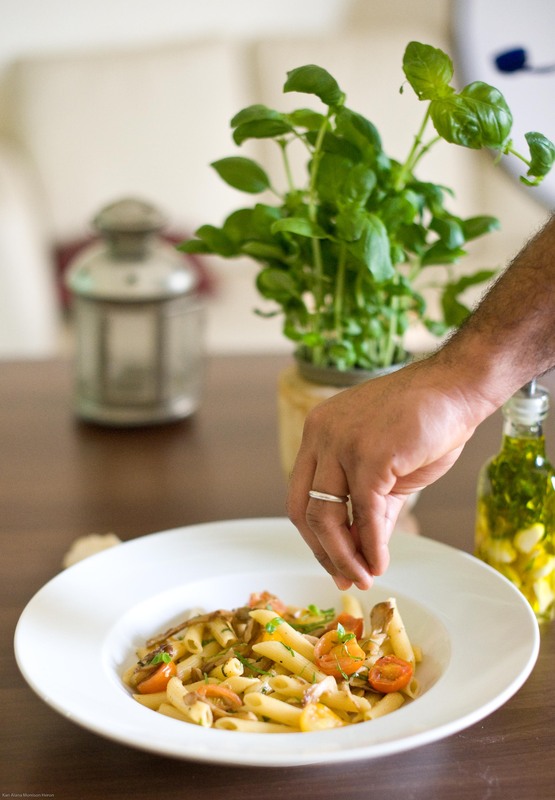 INGREDIENTS: 3 cups Dreamfield’s Low Carb Penne Pasta, 70g Oyster Mushroom, 15 Red and Yellow Cherry Tomatoes, 3 Cloves Garlic, Extra Virgin Olive Oil, Fresh Basil, Freshly Grated Parmigiano Reggiano. (Ignore the tomato paste in the pics). METHOD: While pasta was being cooked, prep your veggies and put on a pot to heat. 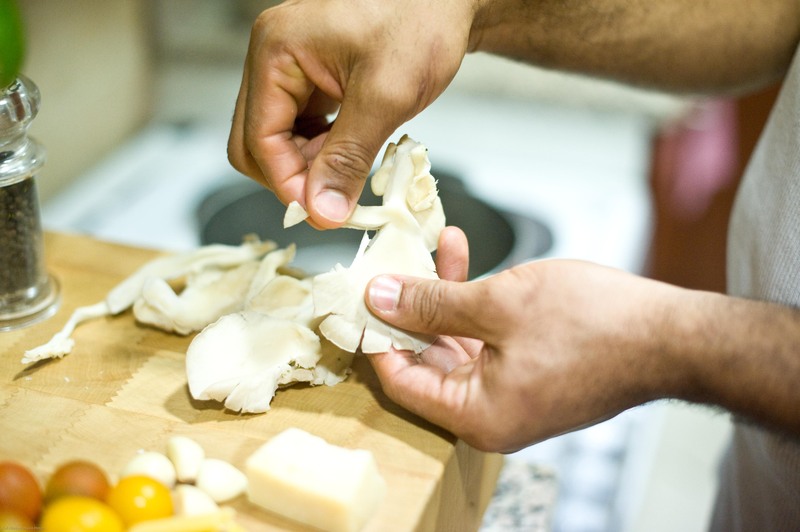 Cut the rough stems off the oyster mushrooms. 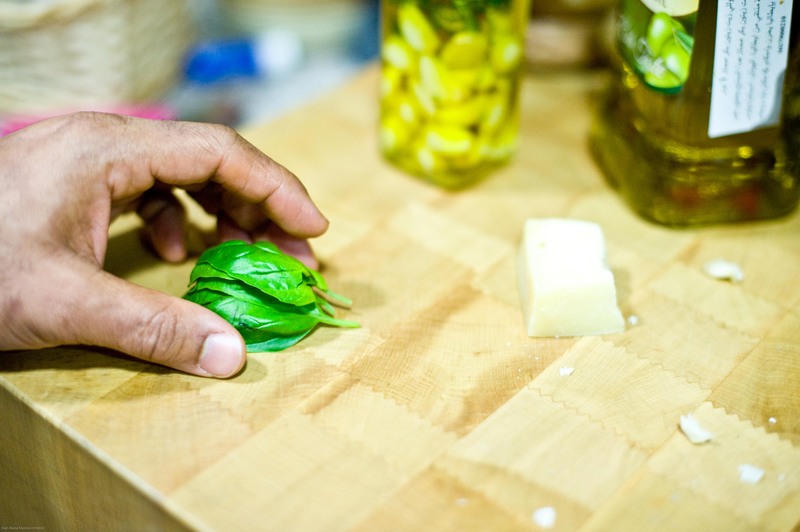 To slice fresh basil, be care careful not to bruise so stack leaves on top of each other but do not bunch up as you would for parsley or coriander/cilantro. 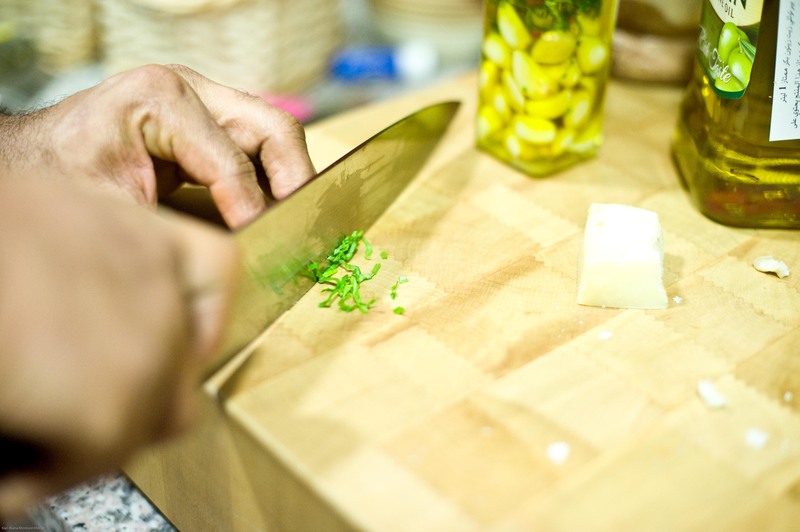 Pressing very gently on the stacked leaves, slide your very sharp knife over them to slice thinly. 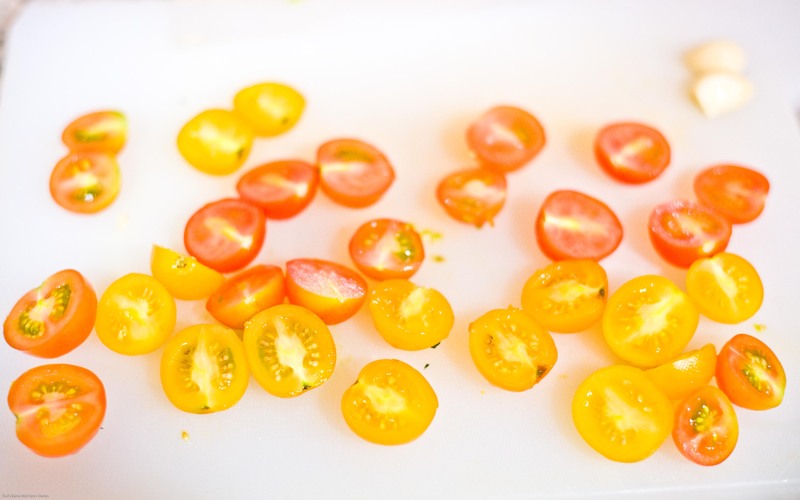 Slice your cherry tomatoes in two … then check on the pasta for doneness. It should be cooked al dente. When cooked, remove from stove and drained. …You have a nice golden brown caramelization. Add the tomatoes cut side down and sear quickly. 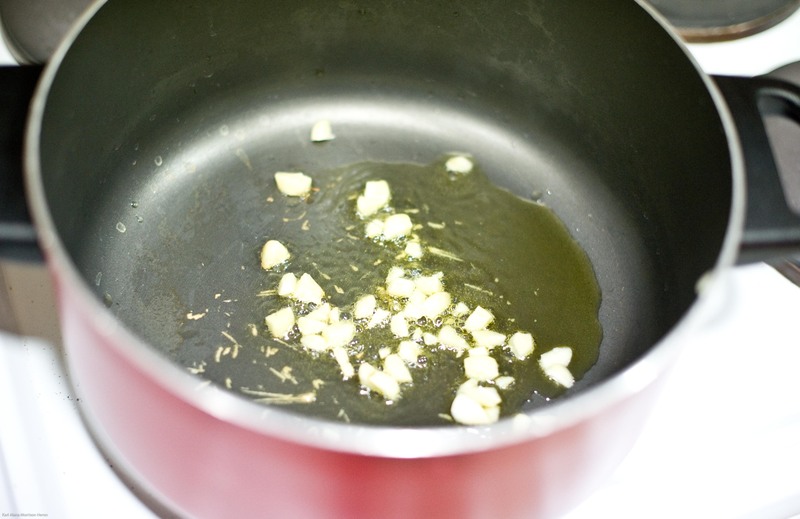 Add basil and stir… reduce heat. Taste and season with pepper and salt if desired. 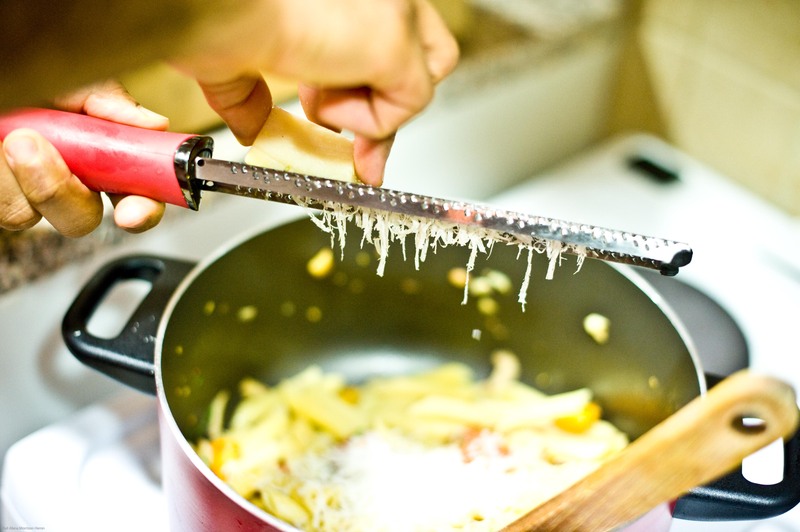 Grate the Parmigiano Reggiano on a Microplane (use any blade you like. We lke the thin shredding of the zester. Remove from heat. 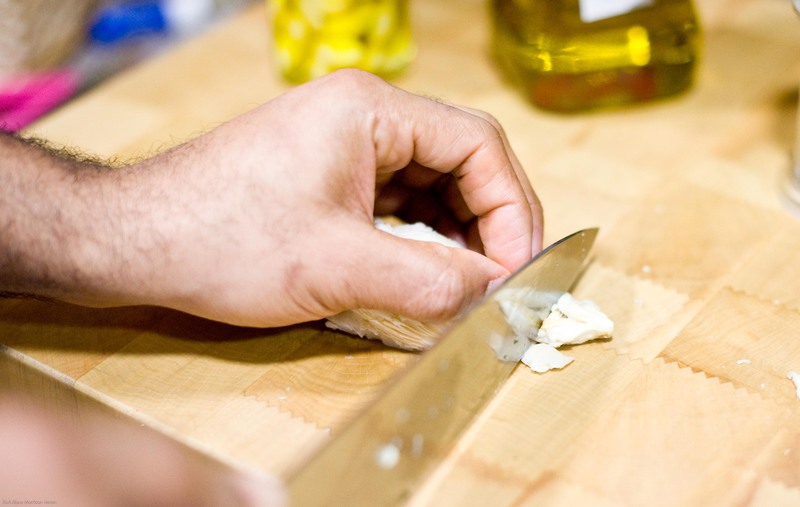 Add a little olive oil right before serving. CHEF’S NOTE: This dish may also be served cold in small portions as an antipasti (Italian appetizer). You may also add grilled chicken or fish like salmon for a great entree pasta dish. 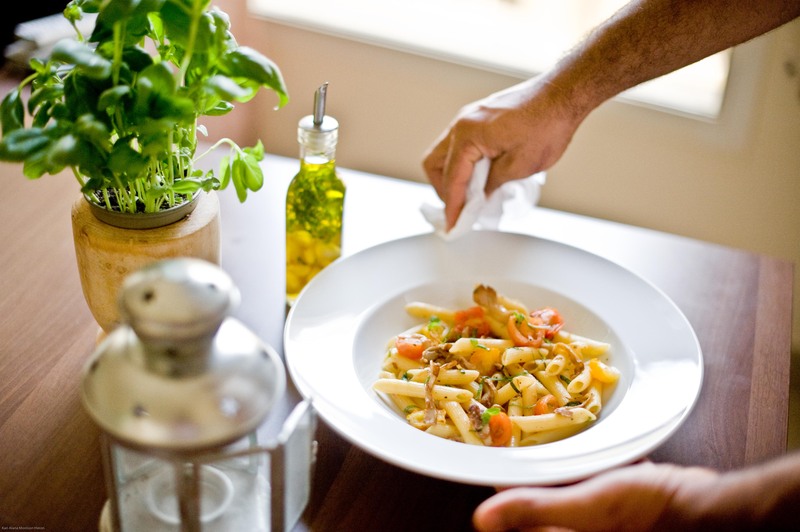 Always keep pasta portions small and add a nice salad or cooked vegetables so you will be able to actually get up from the dining table. I love the use of fresh ingredients in this dish. Very clean.